On Sunday, he spoke to local media after almost five years and announced the first flow of oil from Reliance Industries Ltd’s deep-water wells in the Krishna-Godavari basin. He also said the company would start commercial production of gas from the basin in January. On Monday, the company’s stock fell 0.72%. Investors and analysts blame Reliance for a delay in production of gas that was previously expected to start in October or November this year. That behaviour reflects their treatment of the stock which has a 15.03% weightage in the Bombay Stock Exchange’s 30-stock Sensex, India’s benchmark equity index. Since the beginning of the year, shares of Reliance have fallen 29.29%, a result of falling refining margins and anticipated delays in gas production. The Sensex has fallen 31.02% in the same period. On 18 September, the company’s shares fell to their lowest in the previous 52 weeks, Rs1,764. They ended Monday at Rs2,037.15 each. “Oil production on track is normal. It is factored in but any delay (in gas production) is a negative," said Ashu Madan, national head for domestic brokerage Religare Securities Ltd, which has a “neutral" rating on Reliance and expects the stock to move between Rs1,800 and Rs2,300 over the next three months. Madan adds that in current market conditions, any “bad news will have a ripple effect". After Sunday’s announcements, most brokerages retained their “buy" rating on Reliance, but some have cut their price targets and earnings per share (EPS) estimates. “RIL’s announcements (on Sunday) were in line with expectations, except for the delay in gas production," said Rajat Rajgarhia, director-research, Motilal Oswal Securities Ltd, which has a “buy" rating on the stock. “The street was expecting it to start before December. Minus that, there is no change in the fundamentals of the company." His firm would be issuing a new target price this week and cutting its EPS estimates for Reliance, Rajgarhia added without giving details. But the “buy" rating would stay, he said. In the past two weeks, several brokerages have reduced their target price for Reliance. 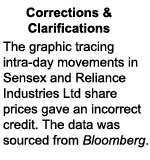 On 10 September, Citigroup Global Markets Inc.’s analysts Rahul Singh and Saurabh Handa said in a note that they were cutting their target price for Reliance to Rs2,450 per share from Rs2,850 because they expected gross refining margins to be around $1.5-2.0 per barrel lower than previous estimates due to “structural tightness for diesel" and increased supply from new refineries. The analysts retained a “buy" rating on the stock. On 9 September, Merrill Lynch retained its price target of Rs2,910 per share for Reliance but cut its EPS forecast by 4-9%. One analyst with a foreign brokerage said Sunday’s announcement was a “disappointment". “We were factoring it (would start) from the end of this year and now it is almost late by a quarter. Therefore, it will have a sentimental impact although nothing has changed in the fundamentals of the company." The analyst, who didn’t want to be named, added that the delay “is a surprise because it is coming from Reliance, which has an impeccable execution record of finishing projects before time." Reliance needs a legal dispute to be settled before it can sell gas from the basin. It is locked in two lawsuits with state-run power firm NTPC Ltd and Reliance Natural Resources Ltd, owned by Mukesh Ambani’s estranged younger brother Anil Ambani. Reliance can produce 80 million cubic metres per day of gas from the basin.